Goodreads Summary: Alexia Tarabotti, Lady Maccon, has settled into domestic bliss. Of course, being Alexia, such bliss involves integrating werewolves into London High society, living in a vampire’s second best closet, and coping with a precocious toddler who is prone to turning supernatural willy-nilly. Even Ivy Tunstell’s acting troupe’s latest play, disastrous to say the least, cannot put a damper on Alexia’s enjoyment of her new London lifestyle. I think Timeless is my favorite book in the series! It takes place 2 years after Heartless, and we learn more about a lot of things. Like Alexia’s father, and his role in the God-Breaker Plague, and what Floote really knows…which is a lot of things. And we learn a little bit more about Alexia’s abilities and the abilities of her daughter Prudence, who won me over! Seriously, Prudence is one hysterically funny child, who really has her own personality. She definitely takes after her parents, who are entertaining as always. There’s a lot going on, and I wasn’t bored at all. In fact, I was thoroughly entertained, what with Ivy’s play, and the vampire Queen Of Alexandria…who needs something from Alexia and Prudence that was totally unexpected. Still, it was one of the really interesting parts of the book, and I liked that it connected to some things in Heartless. I also liked that Carriger focused on Egypt and London. Not only do we follow Alexia but we see what’s going on with Biffy and the rest of the pack in London, and how they’re dealing with things over there. And that settles things for when Conall retires as alpha of his pack. One thing I’ve loved about this series is the narration! Emily Gray does such a great job narrating the series, and I love how she brings the characters to life. I really can’t imagine anyone else narrating the series, and I highly recommend the audio books in particular! 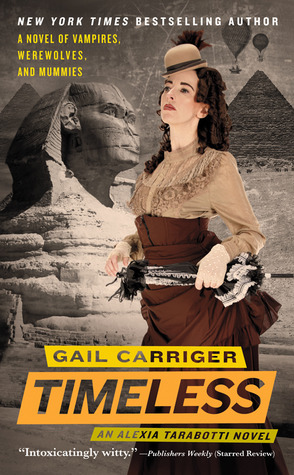 I have really enjoyed this series, and Timeless is a great end to the series. I liked seeing what was going on in both London and in Egypt, and the narration was great. Timeless gets 5 stars.